I was just saying that the most important feature of a carry-on bag was the ability to eliminate your personal item, and right on cue, here’s the Away Carry-on With Pocket. I had previously declared Bluesmart’s Black Edition the best carry-on luggage, but by the time I got my hands on it it was already being phased out in favor of their Series 2 line. While the Black Edition had quite a few innovative features, the game-changer was the external compartment that could easily house your laptop, phone, passport, wallet, Nintendo Switch, and more- no personal item necessary. It was also more than double the price of the Away Carry-on. Aside from the addition of the zip-open, subdivided pocket, this is the same Away Carry-on you know and love. The battery pack is ejectable with one hand so you can drop it like a mic on the jet bridge, and still not USB-C, and there’s no app, built-in location tracking, or built-in scale. Away and Bluesmart weren’t the first and aren’t the only companies to roll out an external personals compartment, but the competitive set is mostly made up of unknown quantities, crazy-overpriced options, or bags that are just hideously ugly. At $275, sized for any overhead compartment, weighing in at 7 pounds, and boasting a lifetime warranty, Away’s Carry-on With Pocket is the roller bag I’d recommend for most people. Update 3/29/18: I also took this opportunity to finally check out something from Away’s sticker collection. I was heartbroken to find that they no longer had any of the “Out of Office”, #personalbrand and all, so I went with Vista by Gabriella Marcella. This is... the nicest sticker I’ve ever seen, sizable and made of 100% leather, with adhesive that feels like it can endure the slings and arrows of the airline industry. I highly recommend adding a sticker for a personal touch if you’re gifting Away to someone. Update 4/4/18: Away’s Signature Garment bag can be your only piece of luggage for a short trip. The Signature isn’t the only garment bag elevated to weekender status or covered in pockets in this space by any means, but it’s a very good execution: well thought out, well made, and great-looking. 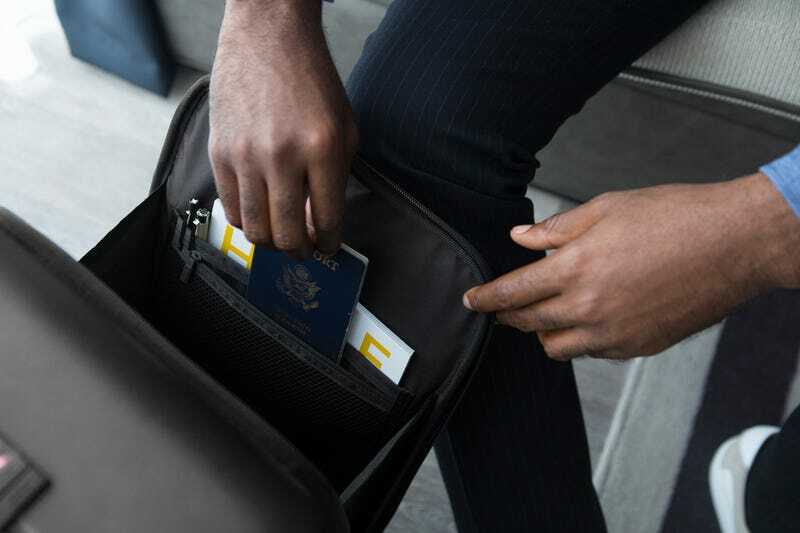 The six pockets can handle everything from passports to size 14 men’s shoes, it can attach to your luggage handle, and it qualifies as a personal item.